Reliance Infrastructure has partnered with MMRDA in Mumbai to successfully implement a world-class transport system for the city of Mumbai, under the Government of Maharashtra, to set up the metro system from Versova to Ghatkopar in order to improve the traffic and transportation scenario in the East-West connectivity of Mumbai. The metro system is operated by the Mumbai Metro One Pvt Ltd (MMOPL). The metro line runs across 11.40 km connecting 12 stations from the East to West. 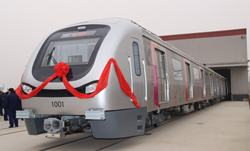 The introduction of the metro system by the Mumbai Metro One Pvt Ltd (MMOPL) provided effective connectivity between the eastern and western suburbs of Mumbai. The 12km line is fully elevated and consists of 12 stations from Versova to Ghatkopar. Track and manage the assets/equipment of these 12 stations. Automation of Maintenance activity, work order generation and SLA management. Handle Job requests and ad-hoc situations. The requirement was floated as a tender and Honeywell was given the opportunity to implement the Building Automation System along with the Enterprise Asset Management system to manage the preventive and break-down maintenance needs of the metro rail network. Honeywell a leader in the Building Automation System / Building Management System significantly met the requirement of controlling and monitoring the mechanical, electrical and other equipment present across all 12 stations. For the complete automation and to meet the entire business requirement of the railway network; Honeywell required an Enterprise Asset Management (EAM) / Computerized Maintenance Management System (CMMS) that will also integrate with Honeywell EBI system. SIERRA's innovative CAFM/CMMS/EAM product eFACiLiTY® - Enterprise Facility Management System was recognized by Honeywell as an apt solution owing to the numerous successful implementations that SIERRA has completed along with Honeywell across the globe. eFACiLiTY's Asset / Maintenance Management, Helpdesk and Knowledgebase system and Drawing & Document Management modules were selected for the project to meet the tender requirements in full. Failure or delays to perform the technical work on-time is addressed by way of the Service Level Agreement (SLA) configurations that provide escalation alerts to their maintenance supervisors, managers etc. eFACiLiTY® along with Honeywell EBI - centrally installed, provided complete accessibility of all 12 stations between Versova and Ghatkopar for reporting problems, tracking & managing assets and reviewing the status of job requests / work orders resulting in a completely automated, healthier, more productive and safer environment.